Bagchi et al. 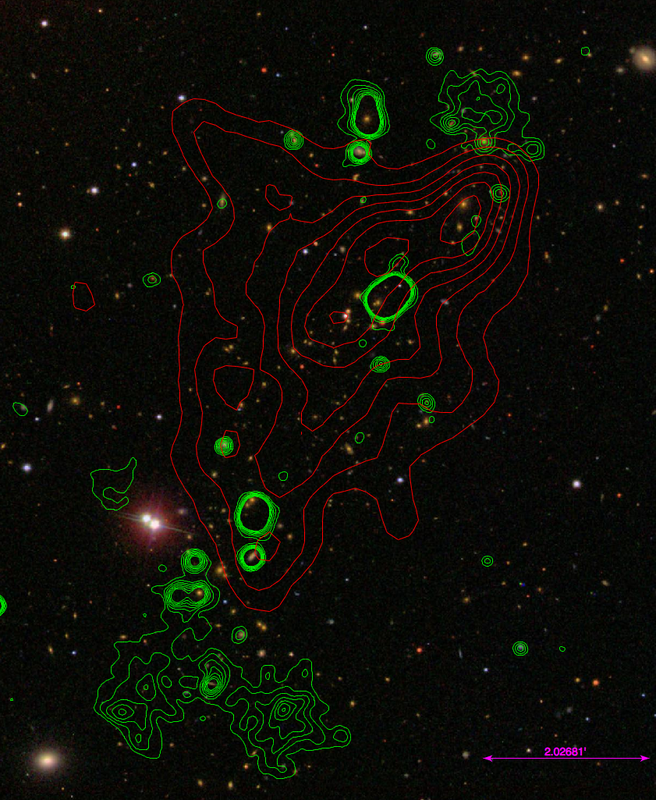 (2002) were the first to discover the diffuse radio emission associated with the radio relics in the 1.4 GHz NVSS survey, and concluded that the emission was the first evidence of cosmic-ray particle acceleration taking place at cosmic shocks. They also noted that ZwCL 2341.1+0000 likely in the process of ongoing structure formation. So in many ways they were the first to directly observe and realize the association between radio relics and merging clusters. van Weeren et al. (2009) followed-up the system with GMRT 157, 241, and 610 MHz observations, confirming Bagchi et al. 's (2002) interpretation, and were able to measure radio spectral indices of -0.49+/-0.18 and -0.76+/-0.17 for the northern and southern relics, respectively . In their analysis they also presented Chandra X-ray observations an found that the ICM of the system is highly disturbed and elongated along the axis of the two relics. Giovannini et al. (2009) obtained follow-up 1.4 GHz VLA imaging of the system and confirmed the existence of the relics. 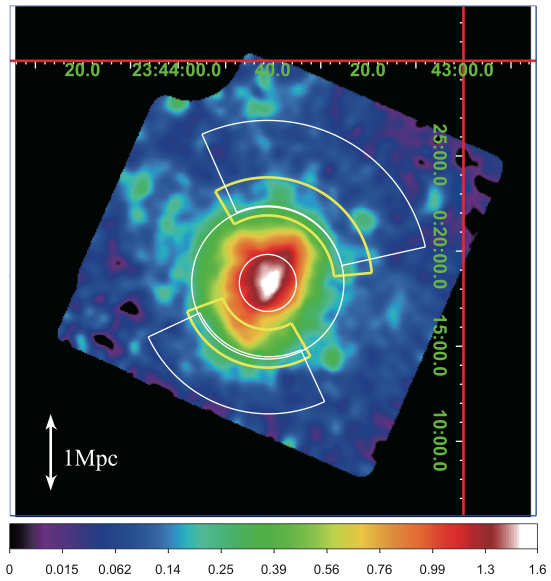 Interestingly they also found evidence for polarized (~11%) diffuse emission along optical filament of galaxies between the two relics, which they posit may be a giant and highly elongated radio halo or the merging of two clusters both hosting a central radio halo. Akamatsu & Kawahara (2013) observed the system with Suzaku in hopes of detecting temperature or density jumps associated with the radio relic locations. While they observe a decrease in both, the angular resolution of Suzaku was not sufficient to check for the presence of a sharp discontinuity. Boschin et al. (2013) conducted a spectroscopic survey of the survey of the system, obtaining 142 redshifts, 101 of which were cluster members. Analysis of the velocity distribution of cluster members yielded two distinct groups, and the possibility of a third. 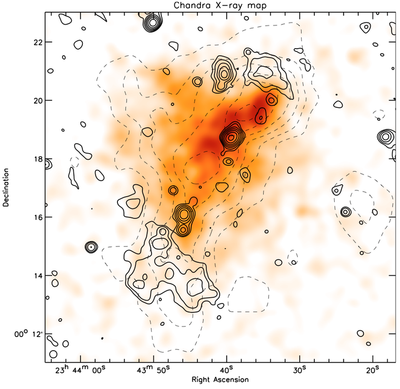 Spatial distribution of the galaxies shows an elongated shape to the cluster in the SSE-NNW direction with four over densities (three very significant), matching the elongated X-ray gas distribution. 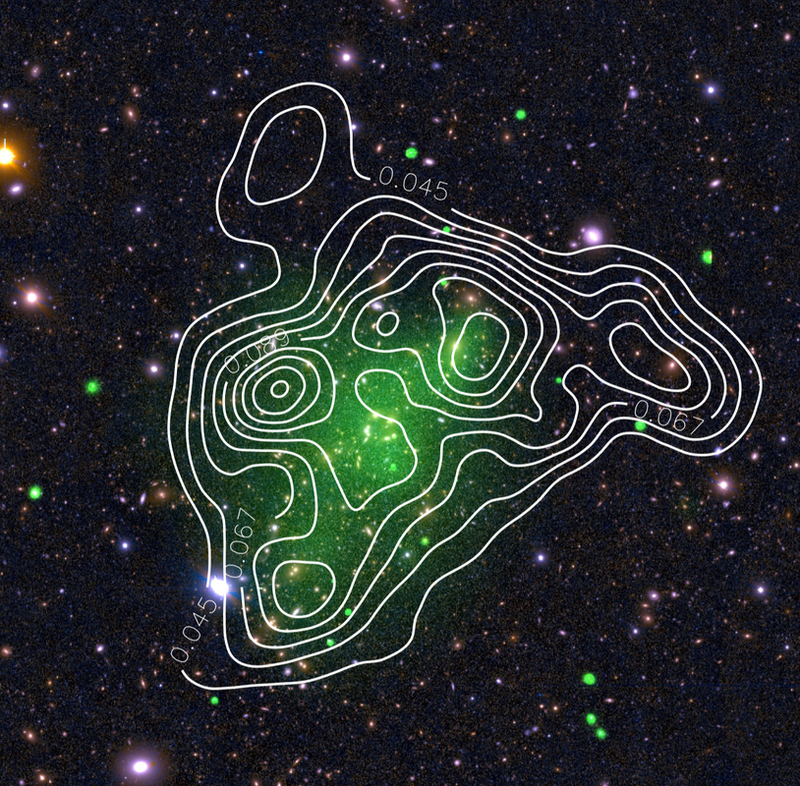 Their color-magnitude selection of cluster members showed a more complex structure, yielding eight additional galaxy density peaks. They estimate a velocity dispersion based mass of a few e15 M_sun for the system. Based on van Weeren et al. (2009) and SDSS photo-z's. Bagchi, J. et al., 2002. 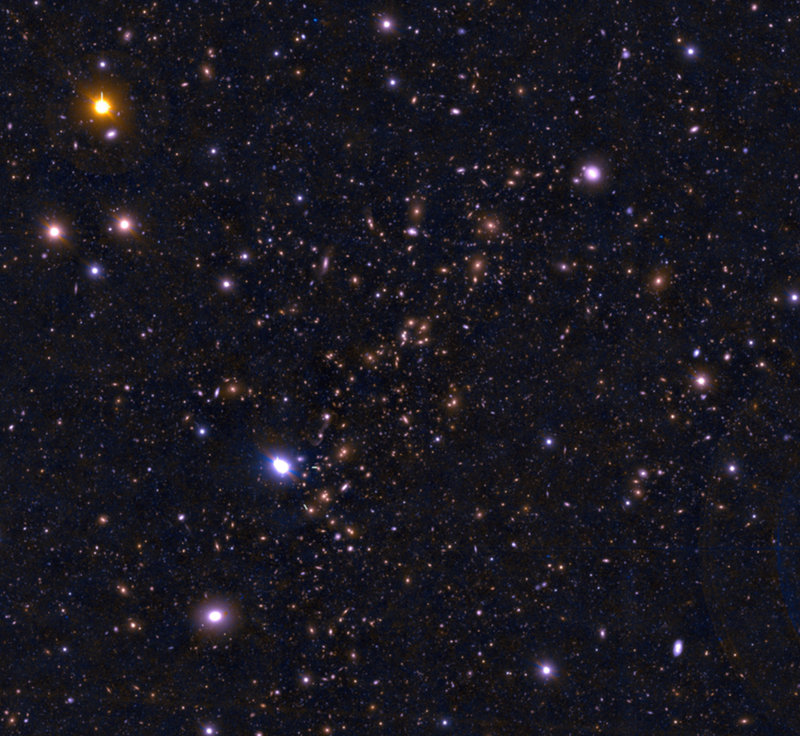 Evidence for shock acceleration and intergalactic magnetic fields in a large-scale filament of galaxies ZwCl 2341.1+0000. New Astronomy, 7(5), pp.249–277. van Weeren, R.J. et al., 2009. 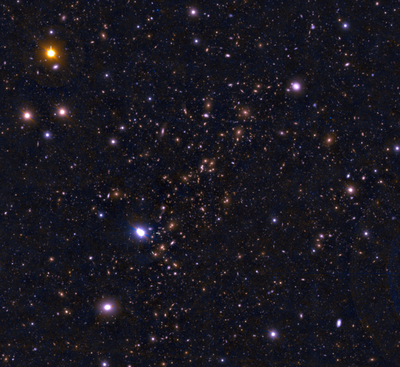 Radio observations of ZwCl 2341.1+0000: a double radio relic cluster. Astronomy and Astrophysics, 506(3), pp.1083–1094. Giovannini, G. et al., 2010. The diffuse radio filament in the merging system ZwCl 2341.1+0000. Astronomy and Astrophysics, 511, p.L5. Boschin, W., Girardi, M. & Barrena, R., 2013. 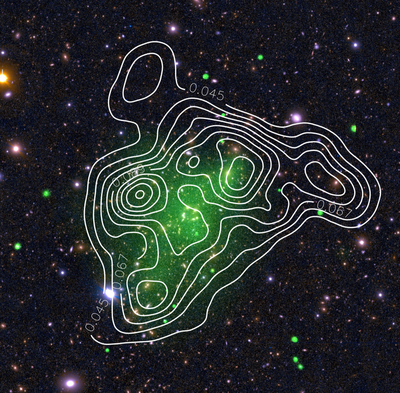 The dynamical status of ZwCl 2341.1+0000: a very elongated galaxy structure with a complex radio emission. Monthly Notices of the Royal Astronomical Society, 434(1), pp.772–783. Ogrean, G.A. et al., 2014. No shock across part of a radio relic in the merging galaxy cluster ZwCl 2341.1+0000?, 443(3), pp.2463–2474.